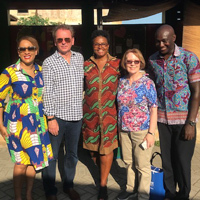 The president and provost met with current students at the campus in Accra, Ghana, to discuss their needs, opportunities and connections to other campuses within Webster's network. 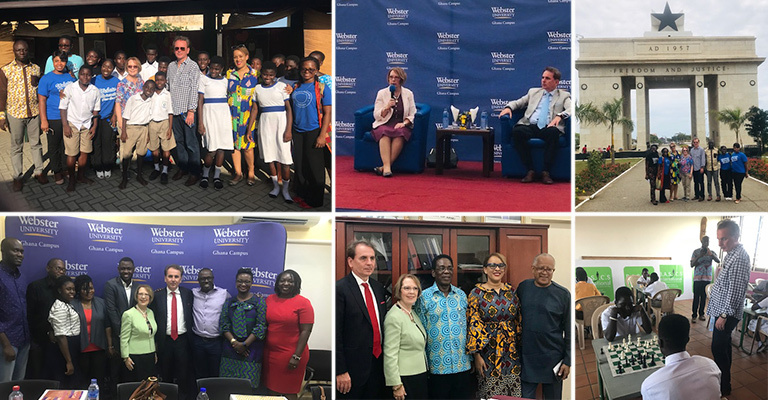 Webster University President Elizabeth (Beth) J. Stroble and Provost, Senior Vice President and Chief Operating Officer Julian Schuster, visited the Webster University Ghana campus this month. For each it was their first trip to Africa and to Accra, the nation’s capital, where Webster opened its campus in 2014. During the first day of their three-day visit Nov. 5-8, the President and Provost met with Webster students, faculty, staff and alumni. A town hall meeting with current undergraduate and graduate students provided an opportunity to discuss the needs and opportunities for Webster Ghana and its connections to other international campuses and the St. Louis campus. The meeting with the recent graduates from Webster Ghana helped to renew friendships and build new relationships with young alumni who are quickly establishing themselves as leaders in West Africa. A tour of the Webster Ghana campus revealed the inventive solutions instituted to meet the campus needs, including an outdoor auditorium used for the campus public lecture series, and the recreational area outside the student residence hall, notably named for the founding Ghana campus director, the late Dr. Thomas Oates. While in Accra, Webster leaders also met with alumni, faculty and staff, local civic and business leaders, and a local NGO. A schedule of official visits included meetings at the U. S. embassy, a meeting with the Minister of Education for Tertiary Education in Ghana, a luncheon with members of the American Chamber of Commerce in Ghana, and opportunity to meet local civic and business leaders and partners who serve as members of the Advisory Committee for the Ghana Campus. A public lecture was held on the campus on the topic, “The Importance of Global Education in the 21st Century.” Both the president and the provost spoke. In her address, President Stroble said it was important to bring students together across borders to gain a deeper understanding of themselves and others and an informed perspective to address the world’s most troubling issues. Schuster noted that one of the most important goals of Webster University is to provide global experiences to students through student mobility for those who choose to study abroad at any of Webster’s international campuses. Their visit culminated in a historic tour of Accra, the capital of Ghana, led by the former mayor, Nat Nuno Amarteifio. They visited historic locations such as the Kwame Nkrumah Mausoleum, the resting place of Ghana’s first president and Independence Square, which marks Ghana as Africa’s first nation to gain independence from colonial rule on March 6, 1957. Other highlights of the visit included a tour of the Christianborg Castle built in 1659, a former seat of government, as well as the remains of a slave house with an auction block where slaves were previously sold. The visit ended with a community engagement with an NGO, Basics International, focused on ending child labor, illiteracy and injustices facing youth. They donated books and school supplies with Christa Sanders, director of Webster Ghana, to the children and staff of the non-profit. This visit also drew local media coverage, including a story about the lecture in Ghana Nation and the lead item in the American Chamber of Commerce Ghana newsletter. Media interest in Webster’s investment in meeting the educational needs of African students reflected the enthusiasm expressed by all with whom the President and Provost met while in Accra.